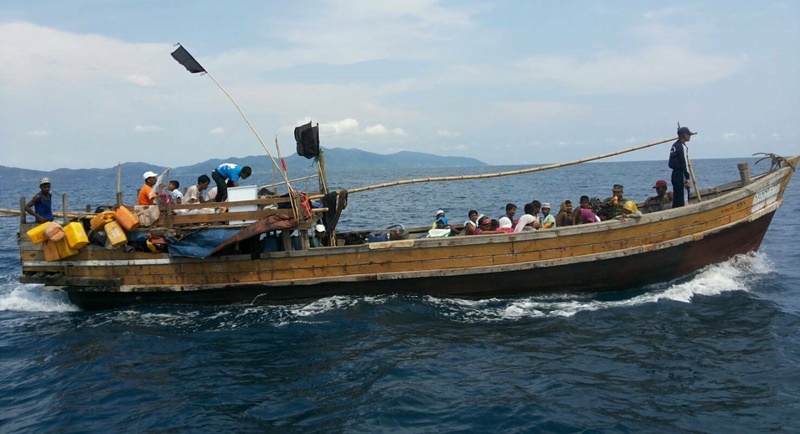 KRABI: A boat carrying dozens of Rohingya refugees trying to reach Malaysia briefly stopped on a Thai island, an official said yesterday (Apr 1), as fears grow about overcrowded camps for the stateless minority fleeing violence in Myanmar. The boat arrived off Thailand’s western coast in Krabi province early yesterday due to bad weather. Images showed the passengers, who said they were Rohingya, being interviewed on shore and then getting back into the boat before departing. Krabi Governor Kitibodee Pravitra confirmed that the people travelling on the boat were Rohingya but said he did not know where they had come from. He said there were about 56 women, men and children on board and that the Rohingya would continue toward their destination. A Thai official who was involved in the response but declined to be named said naval authorities escorted the boat towards Malaysia and that it would likely arrive at the border area this morning (Apr 2). He said local villagers donated food to the Rohingya and that they were “happy” with the help. The Thai official said in this case it was “their wish to continue the journey to the neighbouring country”. Bangladeshi economic migrants have also taken the boat routes south.